The picturesque Amalfi Coast has it all! Comb the pristine beaches, take in the dramatic ocean views, and explore the lovely coastal towns that skim the cliffs, overlooking the picturesque bay. Island hop on the local ferry, hike through orange and lemon groves, explore antiquity, or relax on a terrace overlooking the sea. Stay in an apartment in the center of Amalfi or the cliffs of Atrani. Day trips options: include Positano, Ravello, Capri, Sorrento, Salerno, Emerald Grotto, Naples, Pompeii, and more! Day trips: Amalfi, Positano, Sorrento, the Emerald Grotto, Ravello, Salerno, the islands of Capri and Ischia, Pompeii, Mt. Vesuvius, Naples, Caserta, and Paestum. Sightseeing: The main piazza of Amalfi and its grand duomo, the views of Positano from the sea and the views of the sea from Positano, a visit to the gardens of Ravello’s villas. All these villages are easily accessed by bus or boat. Sorrento’s markets—with lemons as big as your head! Take the boat to Capri, where a funicular will take you to the peaks for a breathtaking view of the coast. The renowned archeological sites of Pompeii and Paestum beacon. Discover the museums of Naples, and have a pizza! Or just enjoy an evening stroll in your home village, or a leisurely dinner of fresh seafood in your local trattoria. Off-the-beaten-track treasures that can’t be beat: A lazy beach day in Marina di Praia is relaxing. You’ll learn all the switchbacks of the coastal roads and the local menus will remind you these are still fishing villages. Sample limoncello (lemon liquor) in Sorrento. Listen to the lively songs of the vendors in Naples’ open air markets. Or shop in the ceramics workshops of nearby Vietri sul Mare. Take a ferry to the island of Ischia, or continue on to its smaller and less touristed neighbor, Procida. Take in the views and nature by hiking into the forests surrounding one of many smaller inland villages. One or two weeks in a personally selected, centrally located apartment on the coast. Transfer by private driver upon arrival from the Naples airport (or rail station) to your new Untours home, and transport back to the airport or rail station on your departure. Regional bus tickets for the coastal bus line that runs between Sorrento and Salerno and connects all the towns in between. An orientation with our local on-site staff to start your visit on the right foot and answer all of your questions about day trips and sightseeing. 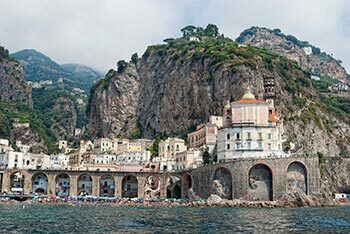 Local information, plus our own Untouring the Amalfi Coast guidebook, researched and written by Untours staff, full of the best restaurants and other suggestions. A local cultural activity, with an emphasis on understanding the local culture.